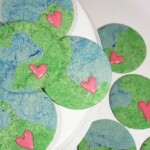 A delicious way to celebrate Earth Day, with these beautiful Earth Day cookies. Using our tried and tested sugar cookie recipe. Cream together butter and sugar in an electric mixer, until light and fluffy. Add the dry ingredients to the electric mixer. Beat until the dough comes together. It will pull away from the sides of the bowl when it is done. Divide the dough in half and add green food colouring to one half, blue food colouring to the other half. We used gel food colouring. Roll each ball to 1/2 inch thickness. Now, rip the dough into small pieces and combine the ripped pieces together on a sheet of parchment paper. When you have covered the parchment paper, use a rolling pin to roll the fragments together. Roll to about 1/4 inch thickness. Use a circular cookie cutter to cut out Earth circles. Bake cookies on a parchment paper lined baking sheet, in 325°F oven for 10-14 minutes. Until lightly golden on the bottom of the cookie. The baking time depends on the size of your cookie. Remove from the oven and place on cooling rack to cool completely. To make the icing combine icing sugar, meringue powder, water and food colouring. Stir until smooth. If the icing is too thick, add 1/4 tsp more water until icing is the thickness you like. Transfer icing to piping bag, with small circle tip, and pipe hearts onto the cooled cookies. Once the icing is dried, enjoy the cookies. Nutritional Info is to be used as a rough guide only. Nutrition Info is based on the products I am using and you may not be using the same products/brands. Thus, the Nutrition Info may vary.